The CAP A-Frame Dumbbell Rack is designed to maximize the efficiency of your workout space, allowing you to store FIVE pairs of CAP hex or rubber hex dumbbells ranging from 5 to 25 pounds (in 5-pound increments). The A-frame design maximizes floor space by storing dumbbells in a vertical fashion, allowing more room for other fitness equipment. 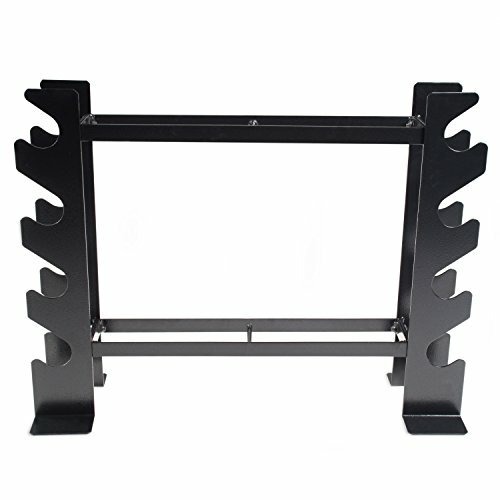 This rack features a durable black powder coated finish with steel construction to hold up to 200-pounds! Easily access and store dumbbells without devoting a large space to your home gym. Dimensions: 14. 4 length x 13 width x 26 height. Rack weighs 10. 5-pounds. Assembly required. *Please read CAP Barbell s policy prior to purchase to understand what the covers and what it does not. HOLDS 200-POUNDS - Designed to hold FIVE pairs of CAP hex or rubber hex dumbbells ranging from 5-25 pounds; Mix and match your dumbbells to fit this rack, up to 35-pounds. Some combinations may not fit. 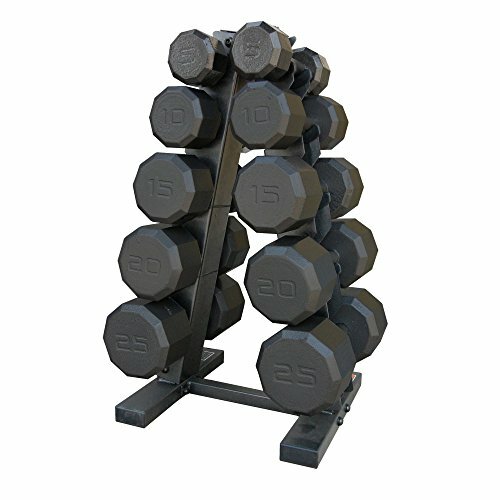 DURABLE AND RELIABLE - Finished with a durable black powder coat and constructed of steel tubing, this rack will safely hold up to 200-pounds worth of dumbbells! TRUST - Trust experience. CAP has been a pioneer in the fitness industry for over 30 years with locations worldwide. Chances are, if you have ever worked out before you have used a CAP product. Organize your full collection of dumbbells and switch from one free weight to another with the DBR-56 Dumbbell Rack from Marcy. This dumbbell organizer offers an easy way to keep your weight lifting equipment from piling up all over your gym. Reap the benefits of fat-burning and muscle-building training in the comfortable environment of your home by managing your equipment so that you don t have to worry about cleanup after every workout. This dumbbell rack stand makes weight organization easy, allowing you to focus on the heavy lifting and not the clean up! Constructed from heavy-duty, 14-gauge steel, this gym organizer has a sturdy structure that won t collapse under heavy loads. Its powder-coated finish effectively resists sweat and moisture to help prevent rust buildup over time, guaranteeing that this equipment is reliable and long-lasting. This weight exercise equipment offers multiple storage spaces around its dual-framed structure, allowing you to store dumbbells of varying sizes and styles. Store your steel and cast-iron dumbbells on the trays so that you don t have to spend time picking up your free weights from different corners of your gym. The compact and low-profile design allows you to conveniently place it in any part of your fitness are without taking up too much space. The assembled dimension is 27L x 8.5W x 21H. Maximize your purchase and get the perfect investment for your home gym with this package that comes with a two-year manufacturer s warranty. The Marcy DBR-56 Compact Dumbbell Rack helps you manage space. Invest in this equipment rack and experience the comfort of working out in a clutter-free home gym. Marcy weight racks include a limited two-year manufacturer's warranty against defects in materials and workmanship. FREE WEIGHT ORGANIZER - Store your weights on a stand where you can access them quickly while keeping things organized in your home gym! The DBR-56 dumbbell rack features multiple trays that accommodate different sizes of dumbbells. HEAVY-DUTY STEELWORK - Keep all of your weights secure at all times with the Marcy DBR-56 Dumbbell Rack. Made from commercial-grade steel, its durable frame can withstand a heavy load while resisting damage from intensive use over time. DURABLE POWDER-COATED FINISH - Reinforced with a powder coating, this versatile dumbbell holder boasts a sturdy construction that won't easily get tarnished with heavy gear. Its polished surface effectively resists scratches and minimizes scuffs. SLIM AND SPACE-SAVING DESIGN - Free up some space in your fitness area with this rack's ergonomically designed structure. Its compact design allows you to place the rack in any part of your gym for easy access to your free weights. Note: The barbell is not included. 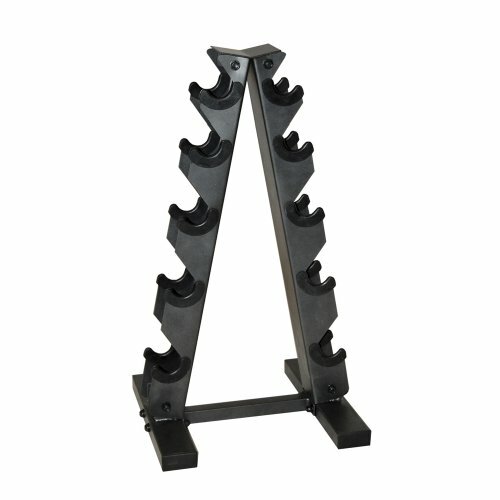 ThiS is a brand new adjustable squat stand. It is ideal for home use. It is made of sturdy steel that provides the maximum safety. It also provides adjustable spotters on each post that ensure your safety. This adjustable squat stand has rubber end caps that protect your floor from scratching. This is an ideal choice for your home exercise. Adjustable to fit your height: range from 41-66 in height. Adjustable spotters for your Safety with 13 positions. Rubber end caps that protect your floor from scratching. Keep all of your equipment organized and in one place with the CAP Dumbbell and Accessories Rack. Store dumbbells, kettle bells and medicine balls effectively with this durable piece of fitness equipment. The CAP Barbell dumbbell and accessories rack is designed to take up as little space as possible, opening up your workout area to hold other items or give you enough space for your personal training. The stand features two levels where you can fit most sizes and brands of dumbbells or other exercise equipment. 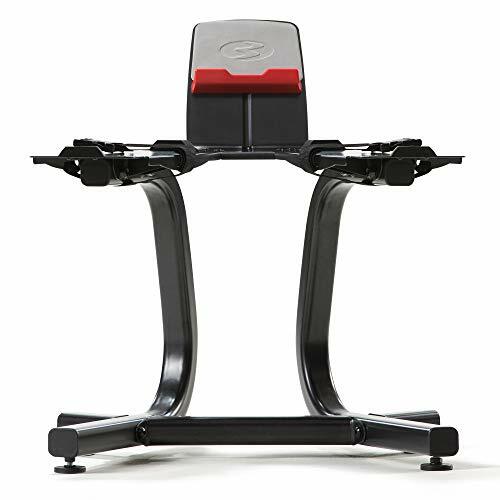 It has a compact design that keeps your equipment off the floor and safely away from workout or walking areas. Add this item to your personal gym and have the items you need on hand for a superb workout. Stay toned, fit and ready to go without leaving home. 500 lb. max weight capacity. 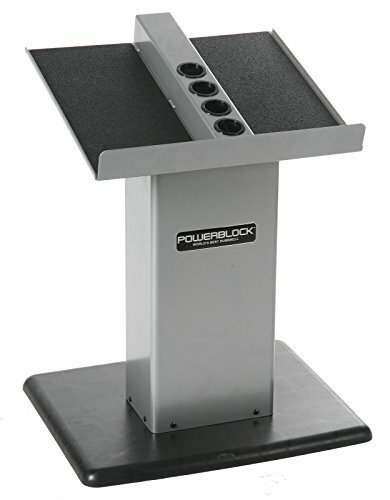 Keep your heavy weights out of the way with this convenient PowerBlock large stand. It features an elegant column design and works with any of your own PowerBlock sets up to 90 pounds per hand. Convenient ports on the top also store your adder weights when they're not in the handles. Keep all of your equipment organized and in one place with the CAP Barbell utility rack. You can store dumbbells, kettle Bells and Medicine balls effectively with this workout accessory. The CAP Barbell utility rack is designed to take up as little space as possible, opening up your workout area to hold other items or give you enough space for your personal training. The stand features two levels where you can fit most sizes and Brands of free weights or other exercise equipment. With a durable metal construction, this steel rack can hold up to 300 lbs. It has a compact design that keeps your equipment off the floor and safely away from workout or walking areas. Add this item to your personal gym and have the items you need on hand for a superb workout. Stay toned, fit and ready to go without leaving home. Made of strong and sturdy high quality steel, this fully functional squat rack provides stable support for up to 550 lbs. Easily adjust the height between 12 different levels starting at 47 inches and going as high as 70 inches. The base is also adjustable for extra stability, making it ideal for more than just squats. Use this equipment for a wide array of exercises such as bench pressing, dips, squats and more! It's like having a complete home gym in one convenient and functional workout station. 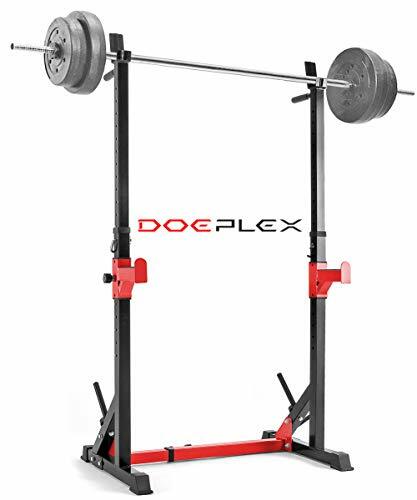 Durable & Stable: The Doeplex Squat Rack is made of high quality steel; the enhanced frame provides extra stability and support for up to 550 lbs. Innovative design: Innovative and Multi-functional design with retractable base. Ideal for dips, bench press, squats, and more. 100% Satisfaction Guarantee: We provide 100% satisfaction warranty. If you're unsatisfied with our product or if it's damaged, we promise a 100% refund and we are just a phone call away! Ah, the sweat of strangers, the uncomfortable grunting, and the eternal mirror-flexing, don't you just love the gym? If you're anything like us, you'd much prefer to lift the CAP Barbell 150 lb. Eco Dumbbell Set with Rack in the privacy of your own home. With their low-emission cast-iron metal construction, these durable dumbbells are built for brawn. They have a baked enamel coating that prevents chipping, rust, and dents. Their ten-sided design prevents rolling, and the included A-frame dumbbell rack gives you safe and secure storage. With exercise this effortless, you'll be light years ahead of the gym rats in no time. CAP Barbell is a leading distributor and provider of fitness equipment. Launched in 1982 with a small inventory of free weights and benches, CAP Barbell has grown over the past 20+ years to include more than 600 products in 10 categories. Headquartered in Houston, Texas, CAP Barbell is dedicated to providing quality fitness equipment at competitive prices, by constructively designing, accurately testing, and manufacturing its products to perfection. Assembled dimensions: 15L x 13W x 26H inches. Low-emission cast-iron metal with baked enamel coating. Weight pairs: 5, 10, 15, 20, 25 lbs.. 10-sided design prevents rolling. 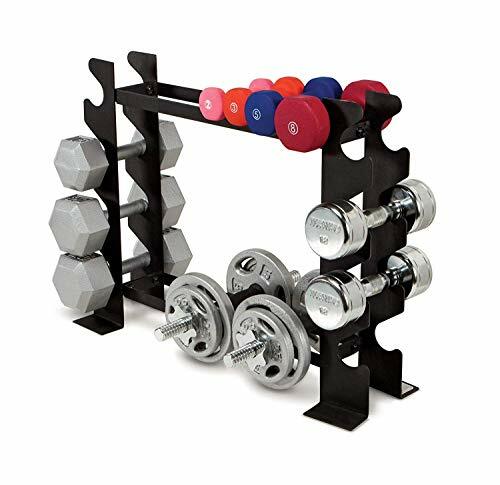 Black A-frame dumbbell rack included. Manufacturer's warranty included (see product guarantee). 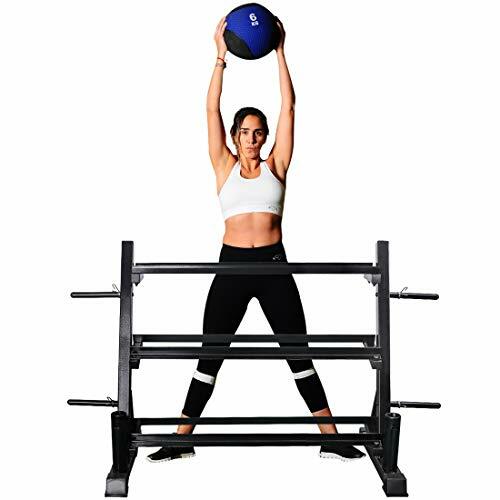 Ollieroo Multi-Function Barbell Rack Dip Stand Gym Family Fitness Adjustable Squat Rack Weight Lifting Bench Press Dipping Station, Height Range 40.6" to 64.2"
Sturdy & Durable -- Ollieroo Barbell Stands are made of high quality steel that provides Maximum safety, Max Load Capacity is 480Lbs. 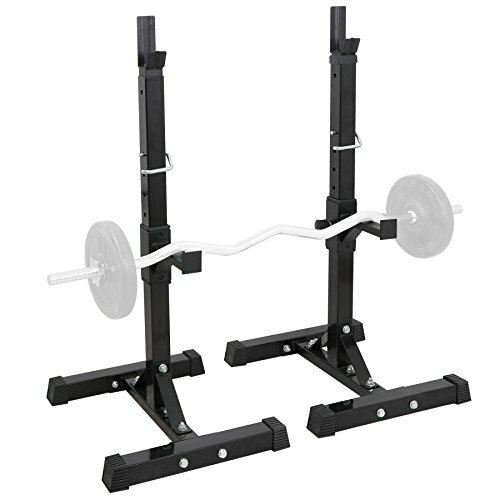 Double Height Adjustable -- Bracket height range 41 to 65; Base range 31 to 49- Accommodates Bench Press. Innovative Design -- Innovative and Multi-functional design with Bell Bar and the unique base (stent more solid). Ideal for flat, incline, and shoulder bench presses, squats, curls, rows, and more. Guaranteed Safety -- Non-slip and abrasion-resistant rubber end caps firmly position the Squat Rack and prevent damage to the floor injured joints. Keep your entire set of Body-Solid hex dumbbells secure, organized, and close at hand during your workout with the Body-Solid Three-Tier Horizontal Dumbbell Rack (GDR363). This weight stand is designed to hold 10 pairs hex dumbbells between 5 and 50 pounds, offering a simple storage solution for your free weight collection. The dumbbell stand is made with heavy-gauge steel. The tubing is welded on all four sides and the metal is de-burred inside and out for user safety. 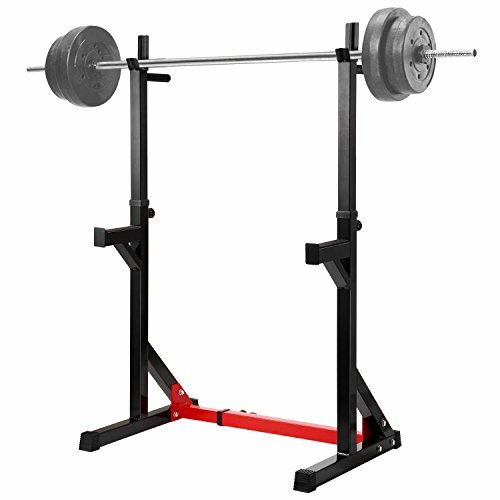 The sturdy, space-efficient design is safe to be placed against a wall or freestanding in the center of a weight room. When assembled, the Body-Solid Tools Three-Tier Horizontal Dumbbell Rack measures 40 by 20 by 30 inches (L x W x H) and weighs 44 pounds. It is backed by the Body-Solid Lifetime In-Home , which fully covers all parts of the dumbbell rack for as long as you own it. Use this weight storage rack with Body-Solid Cast Iron Hex Dumbbells (SDX) or Rubber Coated Hex Dumbbells (SDR). Keep your workout area organized, clean, and safe with this three-tier horizontal dumbbell rack from Body Solid. 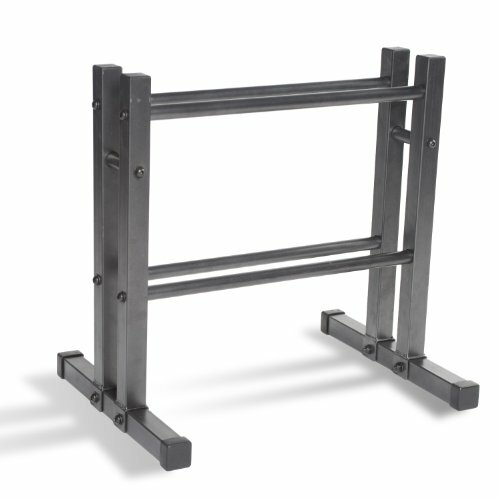 Designed to be placed against any wall or centered in a room, the rack is made of heavy-gauge steel, with all-four-side welded construction that's deburred inside and out for user safety. More importantly, the rack holds nine pairs of hexagonal dumbbells--from 5 to 50 pounds--so you can easily store all your weights in a single compact location. Measuring 40 by 30 by 20 inches (W x H x D), the rack carries Body Solid's lifetime warranty. Enjoy your workouts in your personal home gym with high quality equipment with this multi-functional barbell stand. Made of heavy duty steel for durability, it can support up to 330lbs./ 150kg of weight. The upper rack can be adjusted to 12 positions to fit each person's height and the adjustable base width can better meet your exercise needs. You could have it as low as it will go into bench presses and then raise it up to a high position for squats. Sturdy triangular base provides excellent stability during workouts. Anti-slip rubber end caps provide grip for added stability and protect the floor from scuffs and scratches. Perfect squat/workout rack for the home gym user. 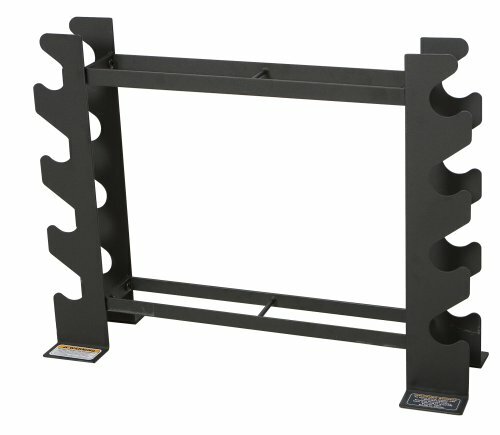 - Sturdy and durable steel stand with a weight capacity of 330 lbs. - Target a variety of muscle groups like your arms, legs, waist, hips, abdomen, etc. - Upper Rack Height: 35.5"- 59"
- Lower Rack Height: 28.75"
ADJUSTABLE HEIGHT AND BASE: The height can be adjusted from 40-64 H and the base can be adjusted from 30-48W to achieve better personal workout results. 4 sets of barbells can be placed on this pair of squat racks and it can be adjusted between 12 rack positions to better suit your height. HEAVY DUTY STEEL CONSTRUCTION: The solid steel material used for this pair of racks are designed to hold up to 330 pounds of weight. The 2 steel metal frame is heavy duty for added safety and stability. MULTI-EXERCISE USE: Allows you to target a variety of muscle groups like your arms, legs, waist, hips, abdomen, etc. Ideal for flat, incline, and shoulder bench presses, squats, and more. J-HOOK TOP BRACKET: The top bracket has a J-hook design to help secure the barbell on the rack for added safety and convenience when working out. Your ideal gym-quality dumbbell rack, start training intensity with it! 4 IN 1: This 3 tier versatile dumbbell rack with horizontal/titled shelves ensures easy loading and unloading of Kettlebell/dumbbells. Olympic plate storage holder and Barbell rack stand store your all equipment in a compact way. With enough storage space to eliminate "over-crowding" of the weights unlike most brands. NICE & NEAT: Keep all of your weights secure in order at all times with the zupapa Multifunction Dumbbell Rack. You can place 6 pair of hex or other style of dumbbell, 4-5 Kettlebell and 4 barbell on this multifunction rack. Barbell holder can hold Olympic, curl, shrug and most other bar types. ABSORBS SHOCK DESIGN: Rubber feet can protect your floor from scratches. It also absorbs shock during re-stocking, preventing the rack from sliding. PUT IT ANYWHERE: This weight rack has an ergonomically designed structure featuring compact and space-saving function. Make it a functional addition to your personal gym, home gym or garage gym. 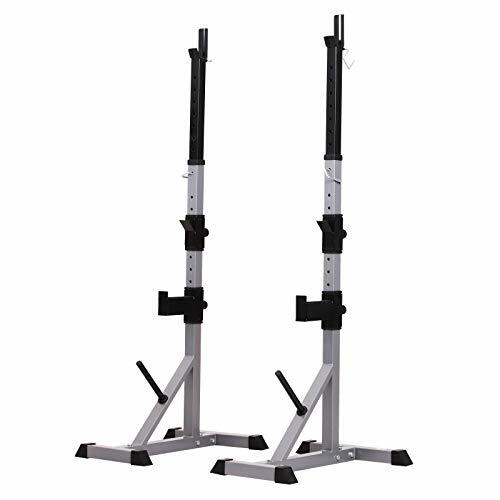 Enjoy workouts in your own personal home gym with this pair of heavy duty barbell stands from Soozier. Made of solid steel for durability, it can support up to 440 lbs. of weight. The rack height can be adjusted from 53"-75" H to better fit each person's individual height. Sturdy "H" bases provide excellent stability during workouts. Anti-slip rubber end caps provide grip for added stability and protect the floor from scuffs and scratches. Soozier presents these perfect squat/workout racks for the home gym user. - Sturdy and durable steel stand with a weight capacity of 440 lbs. 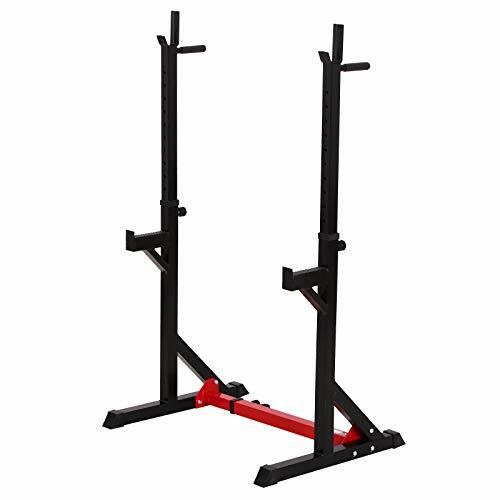 - Upper Rack Height: 52"-73.5"
- Middle Rack Height: 27"-42.75"
- Lower Rack Height: 23"-38.75"
FREESTANDING RACKS: This work out set from Soozier includes two free standing solid metal squat racks for holding barbells. Perfect for use in the home or the garage gym for squats, and bench or standing press. ADJUSTABLE HEIGHT: The height can be adjusted from 53-75 H to achieve better personal workout results. 3 sets of barbells can be placed on this pair of squat racks and each individual barbell height can be adjusted. HEAVY DUTY STEEL CONSTRUCTION: The solid steel material used for this pair of racks are designed to hold up to 440 pounds of weight. The 2 steel metal frame is heavy duty for added safety and stability. Organize your full collection of dumbbells and switch from one free weight to another with the DBR-56 Dumbbell Rack from Marcy. This dumbbell organizer offers an easy way to keep your weight lifting equipment from piling up all over your gym. Reap the benefits of fat-burning and muscle-building training in the comfortable environment of your home by managing your equipment so that you don't have to worry about cleanup after every workout. 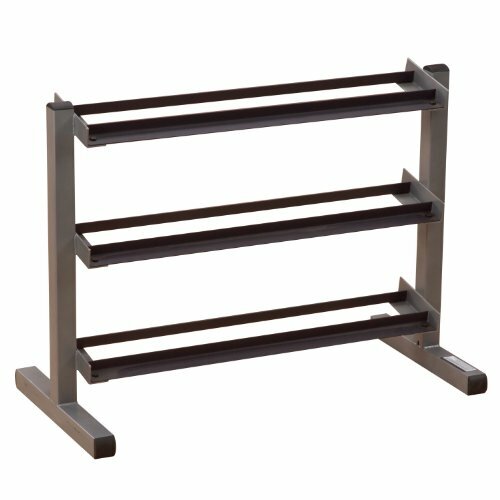 This dumbbell rack stand makes weight organization easy, allowing you to focus on the heavy lifting and not the clean up! Constructed from heavy-duty, 14-gauge steel, this gym organizer has a sturdy structure that won't collapse under heavy loads. Its powder-coated finish effectively resists sweat and moisture to help prevent rust buildup over time, guaranteeing that this equipment is reliable and long-lasting. This weight exercise equipment offers multiple storage spaces around its dual-framed structure, allowing you to store dumbbells of varying sizes and styles. Store your steel and cast-iron dumbbells on the trays so that you don't have to spend time picking up your free weights from different corners of your gym. The compact and low-profile design allows you to conveniently place it in any part of your fitness are without taking up too much space. The assembled dimension is 27L x 8.5W x 21H. Maximize your purchase and get the perfect investment for your home gym with this package that comes with a two-year manufacturer's warranty. The Marcy DBR-56 Compact Dumbbell Rack helps you manage space. Invest in this equipment rack and experience the comfort of working out in a clutter-free home gym.